During this time a luxurious bathhouse was being built at the house of Dioscorus. By his orders the workers prepared to put two windows on the south side. But Barbara, taking advantage of her father’s absence, asked them to make a third window, thereby forming a Trinity of light. On one of the walls of the bath-house Barbara traced a cross with her finger. The cross was deeply etched into the marble, as if by an iron instrument. Later, her footprints were imprinted on the stone steps of the bathhouse. The water of the bathhouse had great healing power. Saint Simeon Metaphrastes (November 9) compared the bathhouse to the stream of Jordan and the Pool of Siloam, because by God’s power, many miracles took place there. When Dioscorus returned and expressed dissatisfaction about the change in his building plans, his daughter told him about how she had come to know the Triune God, about the saving power of the Son of God, and about the futility of worshipping idols. Dioscorus went into a rage, grabbed a sword and was on the point of striking her with it. The holy virgin fled from her father, and he rushed after her in pursuit. His way became blocked by a hill, which opened up and concealed the saint in a crevice. On the other side of the crevice was an entrance leading upwards. Saint Barbara managed then to conceal herself in a cave on the opposite slope of the hill. After a long and fruitless search for his daughter, Dioscorus saw two shepherds on the hill. One of them showed him the cave where the saint had hidden. Dioscorus beat his daughter terribly, and then placed her under guard and tried to wear her down with hunger. Finally he handed her over to the prefect of the city, named Martianus. They beat Saint Barbara fiercely: they struck her with rawhide, and rubbed her wounds with a hair cloth to increase her pain. By night Saint Barbara prayed fervently to her Heavenly Bridegroom, and the Savior Himself appeared and healed her wounds. Then they subjected the saint to new, and even more frightful torments. Both martyrs were tortured for a long time. Their bodies were raked and wounded with hooks, and then they were led naked through the city amidst derision and jeers. Through the prayers of Saint Barbara the Lord sent an angel who covered the nakedness of the holy martyrs with a splendid robe. Then the steadfast confessors of Christ, Saints Barbara and Juliana, were beheaded. Dioscorus himself executed Saint Barbara. The wrath of God was not slow to punish both torturers, Martianus and Dioscorus. They were killed after being struck by lightning. In the sixth century the relics of the holy Great Martyr Barbara were transferred to Constantinople. Six hundred years later, they were transferred to Kiev (July 11) by Barbara, the daughter of the Byzantine Emperor Alexius Comnenos, who married the Russian prince Michael Izyaslavich. They rest even now at Kiev’s Saint Vladimir cathedral, where an Akathist to the saint is served each Tuesday. 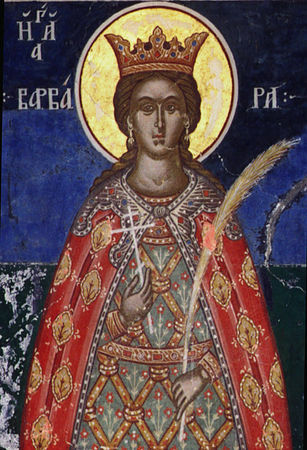 Many pious Orthodox Christians are in the habit of chanting the Troparion of Saint Barbara each day, recalling the Savior’s promise to her that those who remembered her and her sufferings would be preserved from a sudden, unexpected death, and would not depart this life without benefit of the Holy Mysteries of Christ. Let us honor the holy martyr Barbara, / for as a bird she escaped the snares of the enemy, / and destroyed them through the help and defense of the Cross.